Game Face is a returning feature to the FIFA series as of FIFA 13. 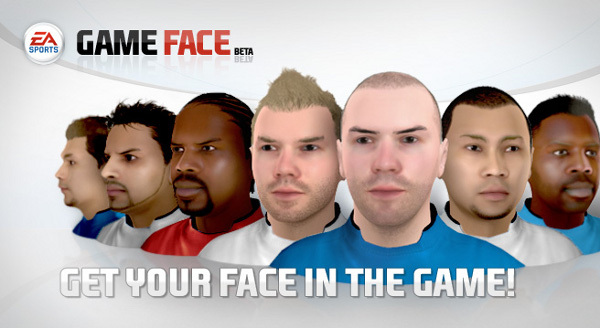 With Game Face, you can upload a front view of your face, or side view for added accuracy, and allow the computer to generate a face model for a FIFA player that looks just like you! You can then download this face on to your console where you can use it on your Virtual Pro. Although your game face will only show up to you in online Virtual Pro games, if you are in a Pro Club team, you or your teammates can even download the game faces of teammates so they will show up during games for everyone. To create your own Game Face, click here. The site will run you through the process. What you'll need beforehand to speed up the process: a shot of the direct front of your face and one from the side. Take this in a well lit area, and make the pictures as centered as possible, I recommend having someone else take the picture for you to ensure that it is straight and centered. The generation process may take quite awhile, but should not exceed more than 10 minutes. If it does, then I suggest quitting and starting over. If the problem persists, refer to the Troubleshooting Guide which can be found within the Game Face app. The result may be quite odd looking, but you might end up being one of the lucky ones who end up with a nice looking one. I think it is a great idea on EA's part, but it rarely achieves awe-inspiring results. Mine tends to end up looking like an alien, but looks alright once I download it on to my console. Also, I recommend messing around with it a bit and keep redoing it until you get it as realistic as possible, because eventually you will set the markers right where they need to be. In order to bring your Game Face to your console: Main Menu - Virtual Pro - Download Game Face. Although you can edit hair, eye color, etc on the Game Face application online, you can also do some more editing on the Edit Pro area. As long as everything is downloaded and saved, you're good to go and can take your newly game face equipped Virtual Pro to the pitch!